When I protested, he told me to call Southwest customer relations in Dallas. But the line there was busy. I used to think that a $68 billion train project from L.A. to San Francisco didn’t make much sense because the great state of California had Southwest Airlines. For most of my adult life, Southwest has been more reliable in California than any utility. It provided the essential north-south connections in our long, tall state with the downscale charm of a great bus service. It was cheap, on time, and offered constant flights staffed by people who did everything they could to get you to your destination. The airline’s stock symbol, “LUV,” seemed appropriate: Passengers, investors, and communities hoping to attract competition to their airports, and thus lower fares, all loved Southwest in equal measure. The glory days of Southwest, and of its power to connect the state, may be coming to an end. 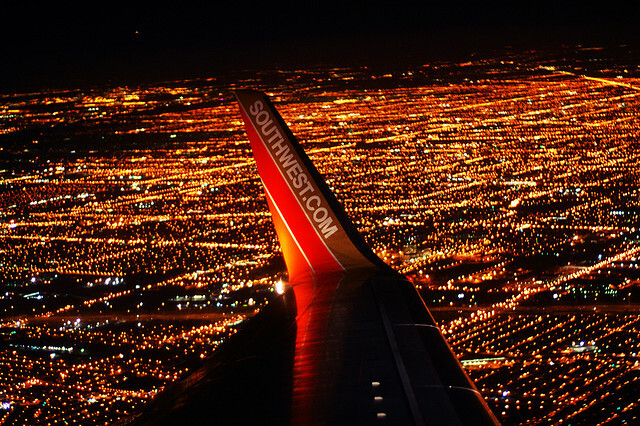 But the glory days of Southwest, and of its power to connect the state, may be coming to an end. Once known for its low fares and high customer satisfaction, the formerly idiosyncratic airline, sadly, is becoming more like its more dysfunctional competitors. Bags get lost, more flights are delayed, fliers are irritated. And prices have risen well above bus-service level. Advance purchase one-way tickets in California are often more than $100 and walk-up fares now approach $250 each way. Most distressing has been the decline of its service culture, which may be connected to labor unrest at the airline. Southwest gate agents and flight attendants who once were empowered to get you on the plane now routinely explain how they can’t help. The gate agent who denied me access to the earlier flight last week explained that he’d love to get me on board, but it was above his head. Of course, Southwest is a public company and must do what is best for its business. But in California, Southwest’s troubles have left an unmistakable void, and it’s not clear who can fill it. Other major national airlines offer far fewer flights between California destinations and, when you count all the baggage and change fees, are usually more expensive than even today’s more expensive Southwest trips. It’d be nice if Virgin America, headquartered in Burlingame, could step up and reduce our reliance on Texas-based Southwest. Virgin America’s pricing is similar to Southwest’s, but its California flights are limited to Palm Springs, San Diego, LAX, and SFO, the last an airport that time-sensitive travelers must avoid because of the frequent weather delays. In this context, high-speed rail looks less like an extravagance and more like a necessity, albeit an expensive one with serious funding challenges. Critics of high-speed rail, like yours truly, used to point out that the projected cost of tickets, usually in the $40 to $120 range, wasn’t any cheaper than flying. But with walk-up fares to go from Burbank to Oakland at $223 last week on Southwest, that’s no longer the case. The projected three-hour train travel time between L.A. and San Francisco also doesn’t look as bad given all Southwest’s cancellations and delays. And high-speed rail is less likely to have its schedules altered by bad weather. There’s a larger point here. California is a big state, and, for reasons of commerce and culture and connection, we need to make it less of an ordeal to get from one place to another. The number of trips between Northern and Southern California by air and by car–15 million a year (about half by each mode) seems awfully low for a state of 38 million people with so many different attractions. But who wants to subject themselves to the misery of Southwest or the 5? Last week, I did make it to my speech, though it cost me. I flew to San Jose and paid another $100 for a rental car and gas to get to Oakland. And Southwest did manage to get me home late the same night. But the battle left me scarred. My family and I had been planning to go up to the Bay Area to see my grandmother and uncle this Thanksgiving week. Now we’ll probably stay home. *Photo courtesy of Paul Goyette.